Moral rights in U.S. copyright law benefit authors or creators of select copyright-protected materials: certain works of visual art. The purpose of moral rights is to protect the reputation of an author or creator. 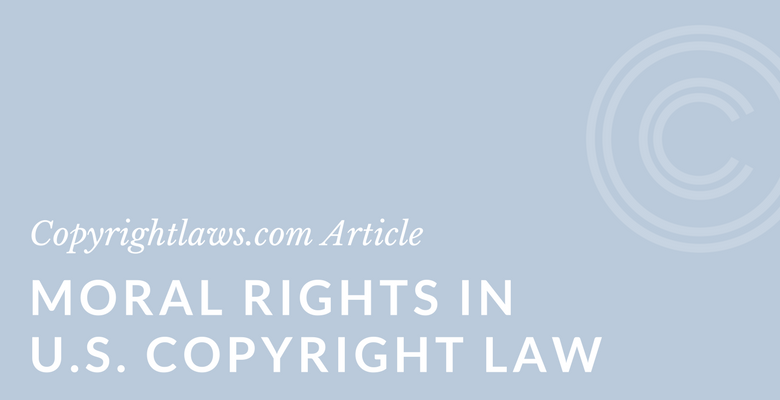 Economic rights (such as the right of reproduction and public performance), which are more commonly understood, provide creators with control over their copyright-protected materials and a way to earn compensation from exploiting their works. Interested in more in-depth information about economic rights, moral rights, and copyright law in general in the U.S., click here. In January 2017, the United States Copyright Office announced its study on the moral rights of attribution and integrity (see below). Moral rights originate from the French droit moral and are often described as being personal to the author or creator of a work. The 176 Berne member states, including the U.S., must meet the minimum standards set out in Berne, including those for moral rights. Thus, each Berne member state must provide for at least the moral rights of paternity and integrity. Countries are free to go beyond these minimum moral rights and provide further rights, such as the right of association, or the right to withdraw permission to use a work. In some countries, authors may waive their moral rights (e.g., Canada) whereas in other countries (e.g., France) they may not. The duration of moral rights varies from country to country. In the U.S., moral rights expire upon the death of the author, in Canada they last 50 years after the author’s death, and in France they are perpetual. The right of paternity refers to the author’s right to have their name on a work, to use a pseudonym and to remain anonymous. For example, an author has the right to have their name on the cover of their book (this is true even if they’ve assigned copyright to someone else). This right is often referred to as the right of attribution. The second component of moral rights, as set out in Berne, is the right of integrity. This is the right of the author to object to any changes to their work that may harm their reputation as an author. Witness testimony about this harm would determine this question of fact in a court. For example, manipulating a scanned photograph may also be a violation of moral rights (the right of integrity), if prejudicial to the honor or reputation of the author of the photograph. The U.S. amended its Copyright Act to include moral rights when it joined the Berne Convention in 1989. However, while the moral rights set out in Berne are intended to apply to all types of copyright-protected works, the U.S. took a narrower interpretation of the moral rights requirements. In some circles, there is controversy as to whether the U.S. is in fact complying with Berne. In the U.S., various federal and state laws arguably protect moral rights, in addition to explicit protection through an amendment to the U.S. Copyright Act by the Visual Artists Rights Act (VARA) of 1990. Some states, such as New York and California, also have moral rights protection for visual artists. VARA gives visual artists the right to claim authorship in their work, and to prevent the use of their name in association with a work. In addition, VARA grants artists the right to prevent the intentional distortion, mutilation or other objectionable modification of their works. Artists who qualify for federal moral rights protection can also prevent any destruction of certain works. Under VARA, moral rights are not transferable by license or assignment, but are waivable (in writing). The rights end with the life of the author (unlike economic rights, which endure for 70 years after the death of the author). On 23 January 2017, the United States Copyright Office (USCO) announced its study on U.S. moral rights for authors. The study focuses on the moral rights of attribution and integrity. It examines how the U.S. Copyright Act and other federal and state laws protect these moral rights and whether it’s necessary to provide further moral rights protection in the U.S.. See the notice of inquiry on moral rights study for further information. Comments on the moral rights study submitted by interested parties to the United States Copyright Office can be viewed here. see our fully online Copyright Leadership Certificate program.